Obyan (pronounced long O, long B, John) is another large beach that is a favorite for snorkelers, skin divers, swimmers, or beachcombers. As you enter the beach you will find a couple large Japanese WW II gun bunkers. 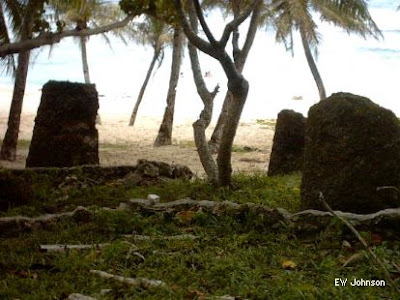 Between the bunkers and just off the beach is an ancient Chamorro village site. Here you will find several latte stones. It is believed that they built their houses on top of these stones. You can walk further inland from the old house site and find a couple interesting small caves. A large paved parking lot with a security guard was recently added. The Obyan area also has nice hiking trails. A couple trails navigates up the cliff to Naftan Peninsula. Another trail led me to this small hole in the ground. ...on this beautiful remote beach. 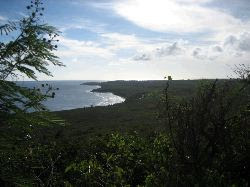 More trails lead to other small beaches, WWII building foundations, and spectacular views. Latte Stones from 1,000 years ago. Other side of the Japanese gun bunker. Picture of Obyan taken from Naftan Peninsula. Obyan Beach with Naftan Peninsula in the background. Looking off the 100' high cliff line to Obyan Bay. WWII artifacts found in the jungle and caves of Obyan. Obyan Beach with the airport in the background. Your welcome and thanks for visiting. 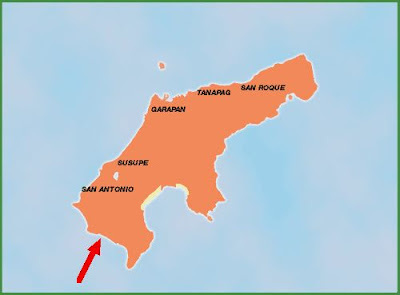 Saipan was missed by the tsunami again. Saipan is very lucky that way. If you would like to see 'Old Man By The Sea' click on its link below. IF I LIVED THEIR I WOULD BE OUT EXPLORING ALL THE TIME . IT'S HARD TO THINK OF ALL THE VIOLENCE THAT HAS HAPPENED IN SUCH BEAUTIFUL AND MAGICAL PLACE . How does one find the hidden grotto where you took the video? Hi Curtfam. The way I found it was by 10 years of searching and hundreds of miles of hiking.